Iowa's MidAmerican Energy has become a major wind power player in a short period of time and has intentions to double its current wind power capacity. When it comes to alternative energy, MidAmerican Energy is one of those utility companies that wants to keep things moving forward. Last fall, the Des Moines-based company celebrated the completion of one of the world's largest land-based wind projects, the Century Wind Project. Dedication of Century Wind followed the completion of MidAmerican's Intrepid Wind Project, also in Iowa, at the end of 2004. The $323 million Century Wind Project--360.5-megawatts, 257 wind turbines in north central and northwest Iowa--came online in late 2005. While the company celebrates its successes--as in the case of the Century Wind and Intrepid projects--it's just as interested in keeping things moving with additional alternative energy projects. This past July, MidAmerican Energy Holdings Company subsidiaries PacifiCorp and MidAmerican Energy announced a total of 223.5 megawatts of new wind energy generation, which will increase the company's renewable energy portfolio to more than 15 percent of its total electric generating capacity. MidAmerican Energy announced a 123-megawatt wind project in northwest Iowa and PacifiCorp announced it has purchased and will own Leaning Juniper 1, a 100.5-megawatt wind project in the Columbia Gorge region of north central Oregon. "MidAmerican Energy Holdings Company business platforms have long histories of commitment to their customers and the environment," said Greg Abel, president of MidAmerican Energy Holdings Company, in announcing the projects. "These new projects are indicative of our company's leadership in developing renewable energy in the United States and abroad." MidAmerican Energy is now number one in the United States in ownership of wind-powered electric generation among rate-regulated utilities, with 695.5 megawatts of wind energy facilities in operation, under construction and under contract in Iowa. PacifiCorp's purchase of the 100.5-megawatt Leaning Juniper 1 wind project is part of the company's commitment to have 400 megawatts of cost-effective new renewable resources in PacifiCorp's generation portfolio by the end of 2007. Also, PacifiCorp has committed to acquire an additional 1,000 megawatts of cost-effective renewable energy to serve its customers' electricity needs by 2015. In total, PacifiCorp owns, purchases or has under contract 1,704 megawatts of electricity from renewable sources: 1,167 megawatts from hydroelectric; 457 megawatts from wind; 29 megawatts from geothermal; and the remainder, 51 megawatts, from solar, biomass and biogas. It really wasn't that long ago that MidAmerican, like many utility companies, was completely focused on traditional energy sources--coal and natural gas. And while that still represents a significant part of the energy portfolio, the emphasis is now on alternative energy sources, with a strong focus on wind power. And that has meant some changes for MidAmerican, but changes that have been accommodated, says the company's wind project manager, Tom Budler. "It really just involved rolling a new energy source, with its different operating characteristics, into the portfolio and into how we dispatch and manage the entire portfolio," explains Budler. Budler took on this new role in 2003, after working for 16 years on the coal/natural gas power plant construction side of the business, and then the energy delivery/operations division. "It's been a huge challenge, but it's been a great experience," he says. The shift into wind power has paid off for MidAmerican. "Wind energy has been a great benefit for us in our portfolio--it's really helped to mitigate the effect of rising energy costs on the company," says Budler. Like other utilities, Mid American has been facing significant increases in the cost of coal and natural gas. That has been a motivating factor in itself, since MidAmerican does not have a fuel adjustment clause--they are unable to pass along increases in fuel costs to customers. From that perspective, the company views getting involved with wind power as a way to better manage risk, says Budler. "With the energy portfolio that we have and the rate structure that is in place, we see being able to generate energy from renewables as a way to mitigate a lot of that risk." The company has been able to keep electricity rates stable since 1995, and it has made a commitment to continue that through to 2010. 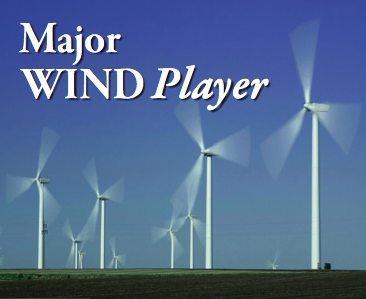 In some areas of the company, the move to wind was, as Budler states, just an additional power source to work with. "We have a good team in our energy dispatch and trading group, and wind was just another resource--on top of the gas, coal and hydro facilities--for them." The big change has come, however, with the on-the-ground operations side. "We've had to build things up on the operations side, but we have good partners in the industry and training has been provided. So we were able to get things ramped up in pretty short order." Those partners included a variety of engineering firms and suppliers. The wind power equipment they are installing generally carries two-year warranties, with suppliers providing any necessary warranty work on site. "We've also contracted with third party operations and maintenance to provide services during the warranty period," adds Budler. "That gives us some time to get up to speed with operational characteristics and what the O and M requirements of the equipment will be like going into the future." And having that knowledge is important since the company has opted to own and operate the wind power facilities. "We have good experience with operating and maintenance of large generating facilities, and we think we do a good job with our assets. We see owning and operating as the best way to manage our risks." With the rate structure the company is operating under, purchasing wind generated power from an outside company would mean they would, in effect, be paying for operational costs, and not having control over those costs. With ownership, comes a greater degree of cost control "We really believe that ownership is the best structure for us going forward." This year has been particularly busy for the company. There was a possibility of a change in the state tax credit, so they've chosen to aggressively expand the wind portfolio by as much as possible. Hence the July announcement of the additional capacity. But MidAmerican is not the only utility that is currently stepping up its wind power production facilities. As a result, suppliers are working hard to meet the demands for wind power generating equipment. "There's great demand right now for equipment," notes Budler, "and turbine supply is short right through the end of 2007. So we're looking at a number of different suppliers and opportunities so we can reach our goal. But it's been a real challenge for us, considering the aggressive targets that we have set." Strategic equipment partners for the company have included GE and Mitsubishi Power Systems, Inc. On the development and construction side, recent projects have involved enXco Development Corporation and Invenergy Wind Development Iowa LLC. enXco is one of the largest operations and maintenance third-party providers for wind farms in the U.S. and is currently servicing more than 4,200 turbines and more than 1,100 megawatts. Invenergy is a developer, owner and operator of utility-scale wind generation facilities and has significant expertise in the development, financing, operation and management of power generation projects serving a wide range of utilities, load-serving entities and industrials. The tax credits are one reason why wind generated power has developed so quickly in Iowa. The state has the third largest wind capacity, 836 MW, after California and Texas. "The tax credits are part of it," says Budler. But a major driving force came from the political side. In 2003, Iowa Gov. Tom Vilsack put out a challenge to utility companies and regulators to work toward achieving 1,000 megawatts of renewable energy in Iowa by 2010. "That's a challenge the leadership at MidAmerican took very seriously," explains Budler, "and we came up with a structure that would allow us to do that." Shortly after Vilsack's challenge, MidAmerican announced plans to build a 310-megawatt wind facility. And there have been a steady number of wind power project announcements since then. Support for wind power--in the form of speeches and challenges from political leaders--is pretty common these days. But action followed words in Iowa. The state government has provided a supportive legislative and regulatory environment. "There is an understanding of what the needs are for large investments in the state, with people taking risk and having the right environment that rewards that risk," says Budler. MidAmerican received praise earlier this year from Vilsack when the company announced it would more than double the amount of energy it currently produces from wind. "As the number one regulated utility owner of wind energy installations in the nation, MidAmerican is a leader in increasing the amount of electricity generated in Iowa from renewable resources," Vilsack said. "The company's ability to invest in new electric generation facilities while continuing to hold the line on electric rates has a huge impact on the energy security of our state." A small amount of that generation is going to be shared going forward. As part of the deal to build up to an additional 545 megawatts, the company has reached an agreement with the Iowa Farmers Union to work with small community-based wind projects to sell the output of their wind projects to MidAmerican. Under the terms of the agreement, MidAmerican will purchase up to 40 megawatts of capacity from community wind projects that are connected to MidAmerican's electric distribution system. Each project can consist of up to 2.5 megawatts, and up to 20 megawatts can be connected at any one delivery point on MidAmerican's system. While these smaller projects don't offer anywhere near the scale of the company's own projects--and will require separate interconnections into the grid--it's still adding to the total amount of wind-powered energy in the state. "We think it's a win-win for everybody," says Budler. The company is also involved with some other alternative energy projects (see sidebar story on page 7 for details). MidAmerican currently obtains 17 megawatts of electricity from generating plants using hydroelectric, biomass and methane as fuel. The company is looking at other fuels such as wood waste and agricultural waste. But Budler notes that for the foreseeable future, the focus will be on wind. In addition to operations in Iowa, MidAmerican subsidiaries also own and operate 10 geothermal energy plants in California and two in the Philippines, producing a combined capacity of nearly 700 megawatts of electricity from naturally occurring geothermal heat. MidAmerican owns and operates the Casecnan Multipurpose Irrigation and Power project in the Philippines, which generates 150 megawatts of hydroelectric power. The company also has a 50 percent interest in the 10-megawatt Wailuku hydroelectric facility in Hawaii. More than 3,000 megawatts of MidAmerican Energy Holdings Company's energy capability, approximately 15 percent, currently comes from green energy sources. MidAmerican Energy has been recognized by the industry for its commitment to wind power. The company received the Renewables Project of the Year Award at the 2005 Platts Global Energy Awards for its wind projects. The previous May, MidAmerican received the American Wind Energy Association's Utility Leadership Award for demonstrating leadership in the increasing utilization of wind power by the electric utility industry. According to the American Wind Energy Association, MidAmerican is now No. 3 in the United States in ownership of wind energy installations. Being at the center of a lot of wind power projects--such as those in Iowa from MidAmerican Energy--can pay off for a state. Last year, Clipper Windpower Inc. set up a $22 million plant in Cedar Rapids to build the company's newly-developed Clipper 2.5 MW Liberty wind turbines. "We believe that locating our first wind turbine manufacturing facility in Iowa puts us in an excellent strategic location to serve the major wind development areas in the U.S. and abroad," said Jim Dehlsen, chairman and CEO of Clipper, of the plant. Competitors for the project included New Mexico, Colorado, Michigan, New York, Maryland, and Nevada. Cedar Rapids was chosen because of the local commitment to renewable energy sources, state and local incentives, quality transportation, proximity to markets and availability of suppliers, said the company.